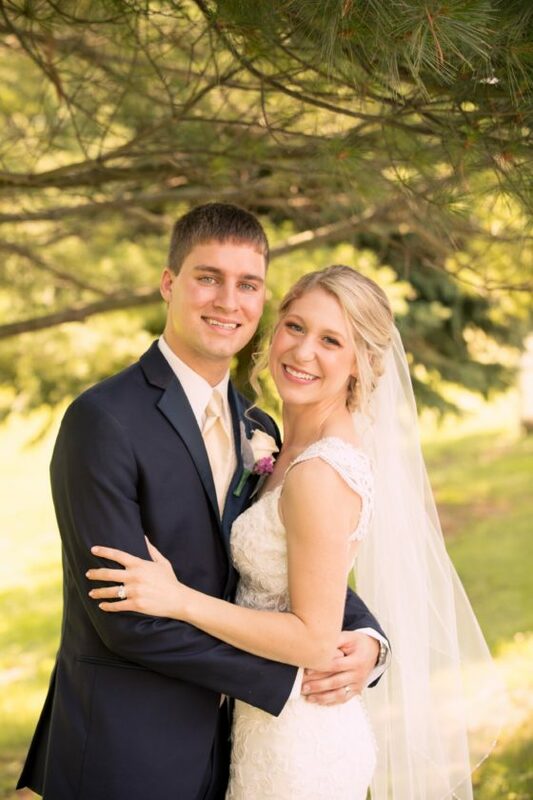 Olivia Ann Sprague and Austin Todd Hilverding were united in marriage on Saturday, June 16, 2018 at St. John the Baptist Catholic Church in Churchtown, Ohio. The bride is the daughter of Douglas and Janelle Sprague of Waterford. She is the granddaughter of Shirley (Bob) Oliver of Marietta and the late Ralph Stollar and Eileen Sprague (Harold Hoskinson) of Fleming and the late Glenn Sprague. The groom is the son of Todd and Monica Hilverding of Waterford. He is the grandson of Harold Jr. (Sonny) and Rita Offenberger of Lowell and Robert and Patricia Hilverding of Stafford. Father Vincent Hawk from Loudonville, Ohio was the celebrant. Friends of the groom, Steven Blake of Cincinnati, Ohio and Haval Norman of Baltimore, Maryland, were the organist and violist during the ceremony. Cousin of the bride, Marlee Stollar of Marietta, served as the cantor. 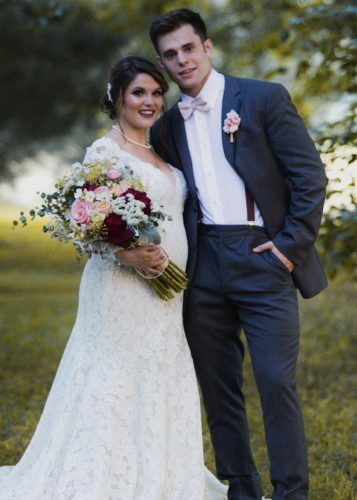 Given in marriage by her father, the bride wore a vintage fit and flare with a sweetheart, V-neckline accented with lace straps that extended into a high back. The gown included lace and tulle over an imperial crepe bodice and skirt and displayed lace side cut-outs and a lace cameo back with a wide flare cathedral train with a double-scallop lace hem. The back of the gown was finished with fabric buttons. Accenting the gown was a simple lace veil with delicate beading around the edge that added a bit of sparkle. The bride carried a hand tied bouquet, lovingly created by her aunt, Cheryl Lang. Tucked into the bouquet was her maternal grandmother’s rosary. Serving as matron of honor was sister of the bride, Vanessa Tiberio. She wore a long magenta mesh dress with a high-neck line and synced waist. Accenting her dress were gold heels and pearl dangle earrings to match, a gift from the bride. The bridesmaids wore dresses and earrings identical to the matron of honor’s. Bridesmaids included Taylor Hilverding (sister of the groom), Cassie Eicher (cousin of the bride), Mariah Stollar (cousin of the bride), Amy Cercek (friend of the bride), and Morgan West (friend of the bride). Serving as flower girls were Clara Stone (cousin of the groom) and Zayda Stollar (cousin of the bride). Clara wore a short cream dress with a magenta flower at the waist. 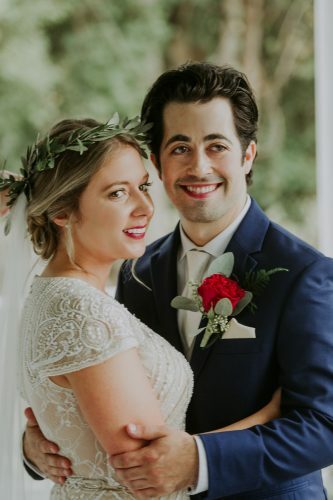 Zayda donned a long cream dress with a magenta sash, which was the exact dress Olivia wore when she was a flower girl in her cousin’s wedding when she was 6 years old. The best man was friend of the groom, John Mostowy. Groomsmen were AJ Mehlow (friend of the groom), Tyler Bernardy (friend of the groom), Matthew Stewart (cousin of the groom), Spencer Bentley (cousin of the bride), and Matt West (friend of the groom). Serving as ring bearer was Jaxon Stollar, cousin of the bride. The groomsmen wore blue suits with magenta ties and vests while the groom wore a gold vest and tie. A reception followed the ceremony at the Marietta Shrine Club with a cocktail hour, dinner, and dancing. Dinner and dance music were provided by Chris Fouss of DJ Associates for guests both near and far. 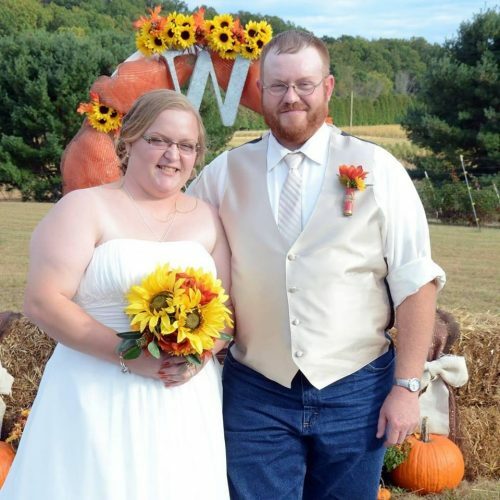 Both the bride and groom are 2012 graduates of Waterford High School. 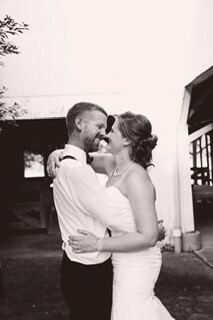 The bride is a 2016 graduate of Ashland University and is currently a first grade teacher in Newark City Schools in Newark, Ohio. 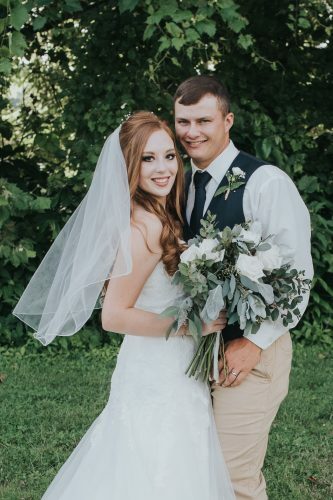 The groom is a 2018 graduate of Ohio Northern University. He is currently a pharmacist with Shrivers Pharmacy. 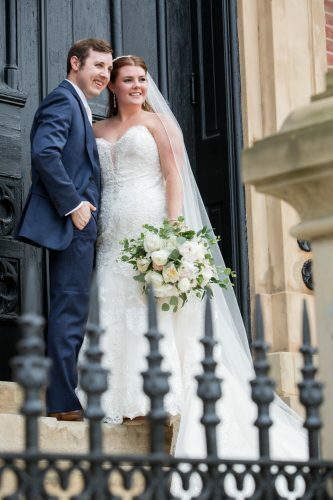 The couple honeymooned in Punta Cana, Dominican Republic and now resides in Lancaster, Ohio.